The GOOD Cities Project — led by Bristol Baughan, Oscar-nominated and Emmy-winning filmmaker — is diving into a five-month multi-media exploration with Ford Motor Company and inviting their favorite thought leaders to create visual love letters to cities across the country. The Street Museum of Art was asked to share our unique and personal perspective of the city we live in and love through billboard takeovers in and around New York during the month of November. Focusing on found works of street art that have taken on lives of their own throughout this city, SMoA’s behind-the-scene video and billboard designs call for the public to take an active role in the GOOD Cities Project and ‘Rediscover Our City’ through the lens of a street artist. One of our best pieces of advice when it comes to hunting out street art: Don’t forget to look up. 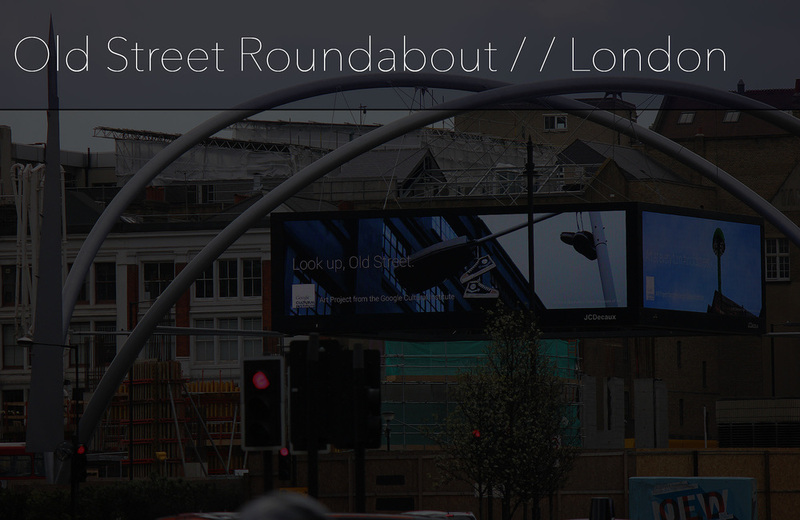 Specifically, look up at Old Street Station in London where we were happy to help get our friends Christiaan Nagel + Skewville’s artwork up onto the big digital billboard there, in collaboration with Google for their “Creativity at Every Turn” campaign. The work featured in these billboards are part of The Street Museum of Art’s current guerrilla exhibition Beyond Banksy: Beat the Streets currently on view around Shoreditch, London. 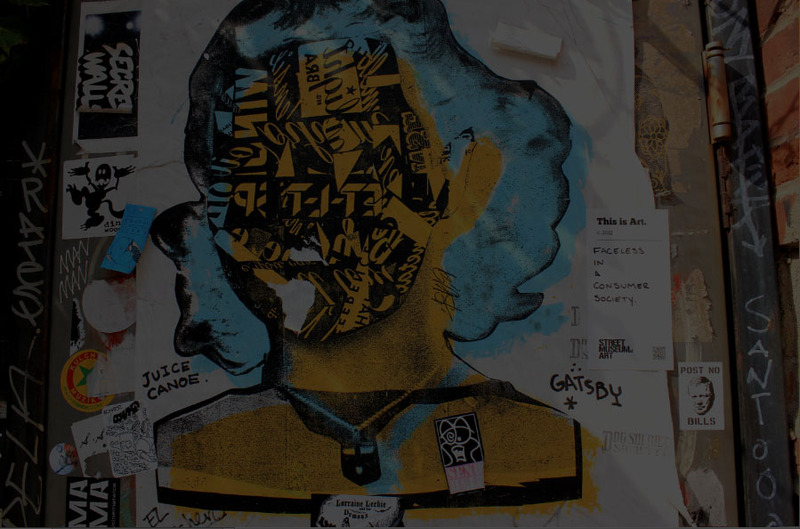 When the Street Museum of Art began offering sticker labels to the public for free in 2012, they were initially intended to be placed on the streets — drawing attention creative expression that exists outside art world institutions. By mimicking a museum’s didactic labels, SMoA’s stickers encourage the public to participate in this project and draw attention to the cultural importance of street art. SMoA's labels play up the idea that while street art can never be exhibited inside a museum, it is just as current and influential within contemporary art history as anything you may find in the New Museum or MoMA, for example. Today, inside the Worcester Art Museum (WAM) in Massachusetts — the same museum that recently made headlines for its acquisition of the 16th century “Venus Disarming Cupid” by Paolo Veronese — hangs a label from the Street Museum of Art. 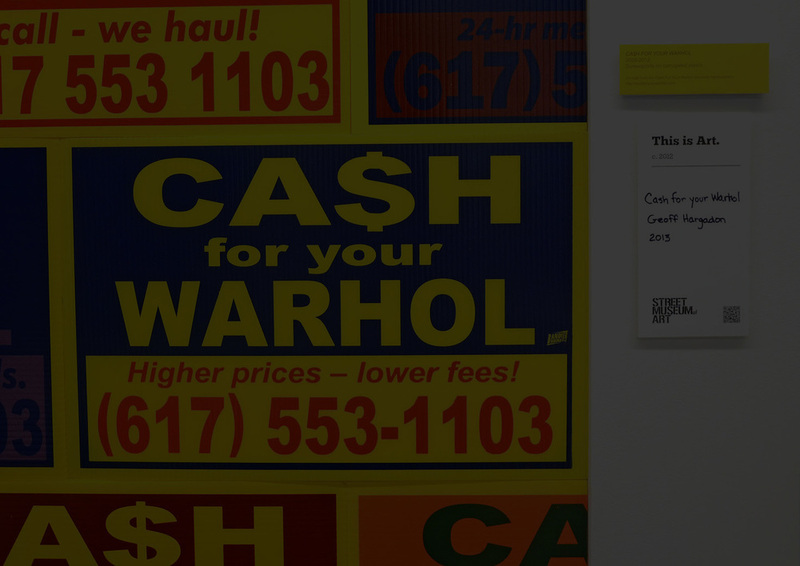 Filled in by hand with a permanent marker, the label marks an installation by Massachusetts’ own Cash for Your Warhol, hanging inside the offices of Adam Rozan, WAM’s Director of Audience Engagement. An unlikely place for the Street Museum of Art to appear, indeed, but Adam Rozan is a fan of street art and brought SMoA’s label into the museum to highlight Cash for Your Warhol's installation amongst the traditional collections WAM houses. We are interested to hear your thoughts! I when I first heard of The Street Museum of Art (SMOA), I immediately wanted to visit and check it out. After searching for SMOA online, I realized, of course, that it’s about the street and each street has the potential to be a museum unto itself. I’ve been a huge fan of Geoff Hargadon’s Cash for Your Warhol series since its beginning. The work successfully accomplishes what any great piece of street art does, engages its audience. Here, awareness becomes art and art becomes defined. When I recently moved to Massachusetts from California to become the Director of Audience Engagement at the Worcester Art Museum, I invited Geoff for a visit and tour of the museum. Sitting in my office later in the day, we realized that what was missing in the space was a wall of Cash for Your Warhol signs. Soon, my wall became a mix of color and messages, a play on signage, on art, even on office art. Now when people come into my office, the first thing they see is this brilliant pattern of colors. It’s beautiful and I love it. In October 2012, The New Museum held a screening of Graffiti/Post Graffiti followed by a panel discussion at the museum around this film and the long-term transition towards graffiti exhibitions. The discussion brought legends from the early years of NYC's graffiti history together again on one stage — including Patti Astor, Fab Five Freddy, Lee Quiñones and Lady Pink. The New Museum brought heavy hitters from the contemporary street art and graffiti scene together under one roof to watch this discussion unfold — and The Street Museum of Art took this opportunity to introduce a new kind of exhibition style. Outside the museum's entrance The Street Museum of Art chained up a re-appropriated local news box (sorry L Magazine!) which was filled with copies of the public art project's Manifesto. This Manifesto included a call to action for the public to join in on this radical new guerrilla curating project with free SMoA starter kit sticker packs. The Street Museum of Art (SMoA) is a public art project aimed to challenge previous methods of exhibiting street art. As the rest of the art world begins to accept this urban medium, it is only becoming more apparent that street art inevitably resists containment. The question then should not be how can this inherently public art form be modified or replicated in order to fit within the confines of a museum, but rather how can the current model for contemporary art museums be re-examined to conform with the energy of street art? The Street Museum of Art calls for all New Yorker’s to take part in this action by helping to create the first truly public art museum. 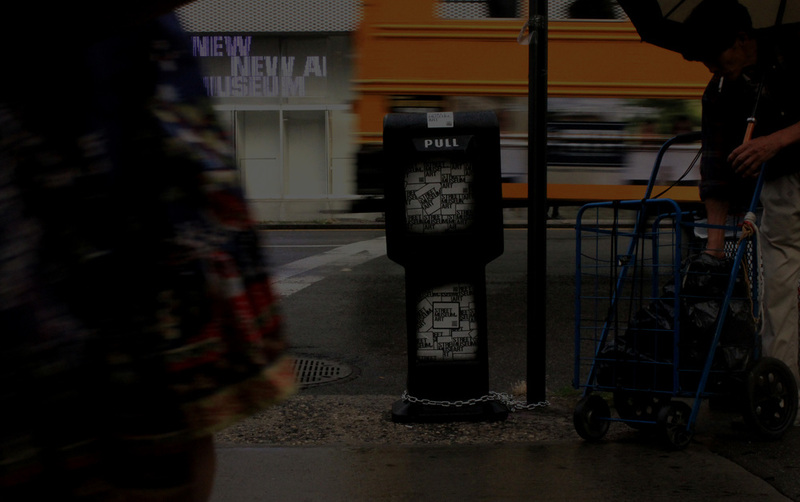 Blank, self-adhesive labels are now available to the public on the Bowery as well as on The Street Museum of Art’s website — ready to be filled out with a personal description and posted around the city. All photos submitted of the found works of art with their labels will then be added to SMoA’s collection, documenting the progress of this project. As The Street Museum of Art encourages the public to begin visually exploring the city through this new lens, the labels provided will act as a tool that allow others to take a stand in voicing their support for a new level of awareness and appreciation for this radical art movement. The Street Museum of Art proposes a new museum model that exists without the confines of white gallery walls, high admission fees, or intimidating building façades but is instead fully immersed within the fabric of society. To contribute and add a work of art to the collection, submit a photo of the work with a detail of the label and where it is located to join@streetmuseumofart.org.